Gameplay for Dragon Punch is simple, hit the target with the most pressure to gain the highest score. 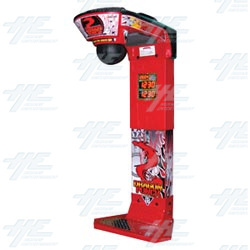 However, unlike other punching arcade games, Dragon punch is designed as a punching game with a difference, the target is up high and most people will have to jump to hit the bag with enough pressure to get the best score. It combines skill and strength, and can be quite addictive for even the most novice of players. Furthermore, Dragon Punch comes with an additional bonus function for the saving highest score record. Dragon Punch is an easy game, however with the saving highest score record function, it can be rather addictive! Players will come time and again to try and beat the top score and land the most powerful punch. This arcade machine is suitable for a wide range of locations such as arcade centers, family entertainment centers, sporting clubs, sporting events and commercial locations. This machine has been fully reconditioned and is in excellent condition with a new game board, new stickers, new machine rubber and has been repainted. For more information or to make an inquiry, please follow this link.